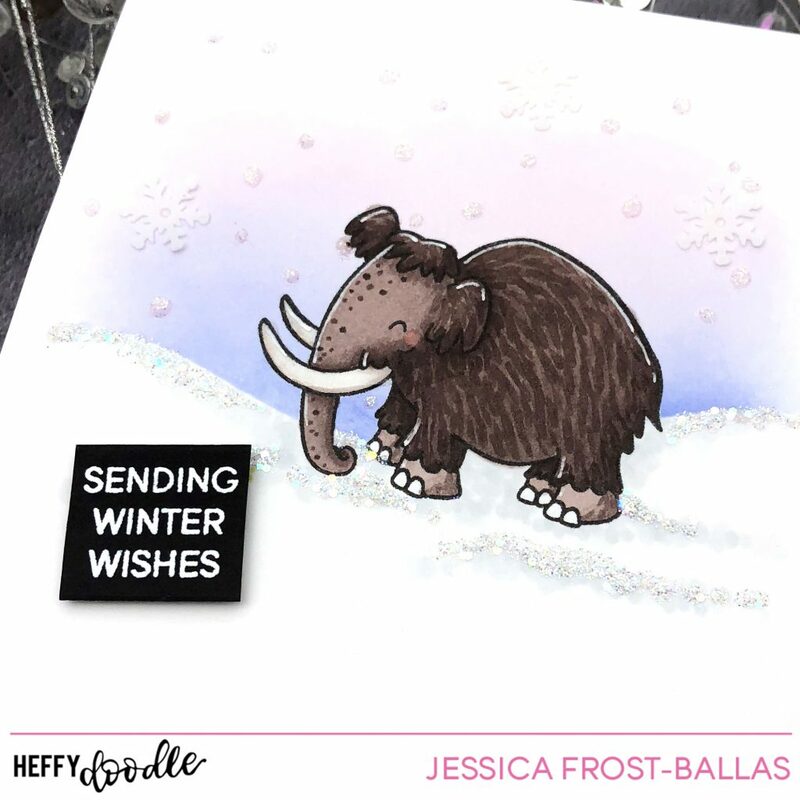 I just LOVE that little woolly mammoth from Prehistoric Pals! Isn’t he cute?! 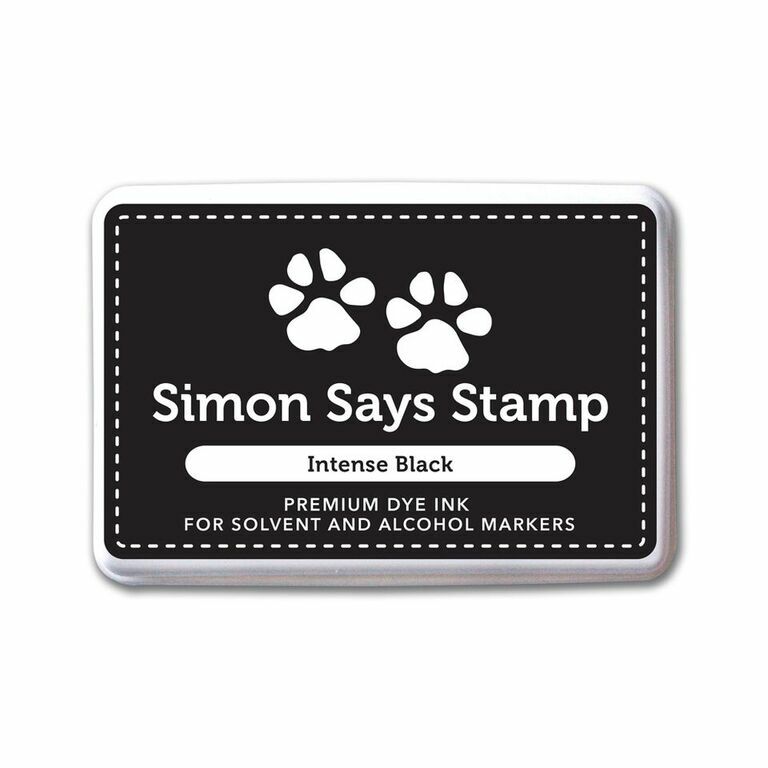 To start I stamped him on my card with intense black ink and masked him off with a post-it note. Then I placed the First Snow stencil over the panel and used the life-changing blender brushes to blend a soft pastel sky using spun sugar, shaded lilac, and blueprint sketch distress ink. I’ve gotta say…I did not want to like those brushes (I never particularly cared for the other blending brushes that were popular awhile ago) and I just figured they couldn’t do anything that my blending tools couldn’t do but I was WRONG! If you’re wanting to do more soft blends I can’t recommend them enough! 😉 Anyway, once I was done blending I applied a thin layer of moonstone nuvo glimmer paste over the stencil. I peeled up the stencil and let the paste dry. Once the panel was dry I colored my woolly mammoth with copic markers and added a few accents with a white gel pen. Then I added a few accents to create snow on my background panel using cool grey copic markers. I added a little crystal glaze and then sprinkled the glaze with chunky and prisma glitter to create sparkly snowbanks. 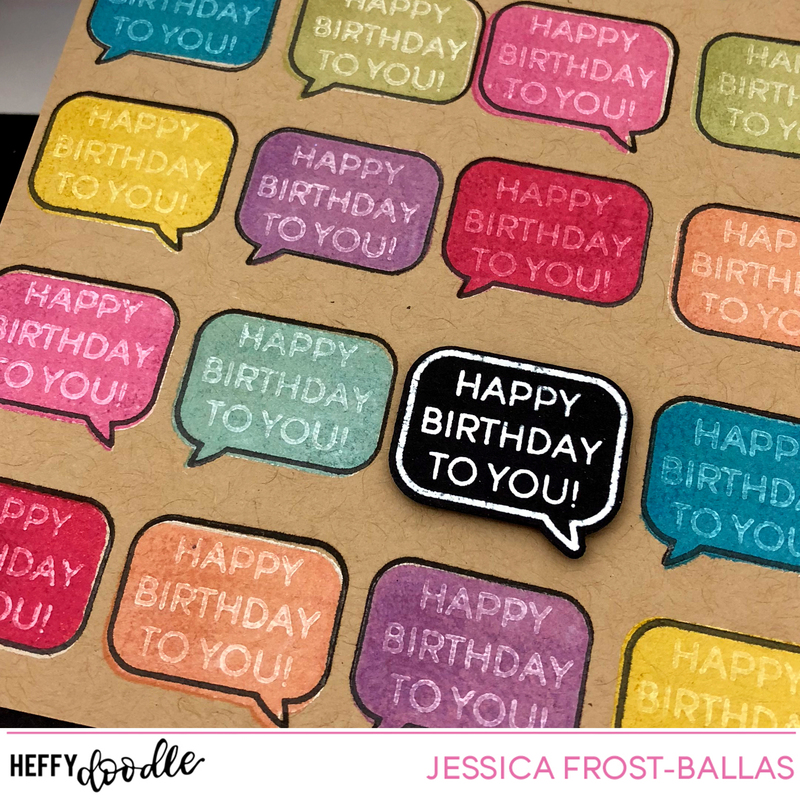 I stamped the sentiment from Whatcha Saying Now onto black cardstock with versamark, heat-embossed it with white embossing powder, and popped it up with a little foam mounting tape. Finally I added a few snowflake sequins to finish the card! 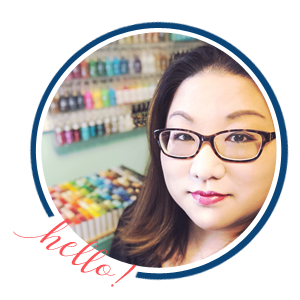 Lesley is giving away a $50 voucher to the Heffy Doodle shop to one lucky commenter! Comment on all the hop stops before November 1st, 2018 for the most chances to win! 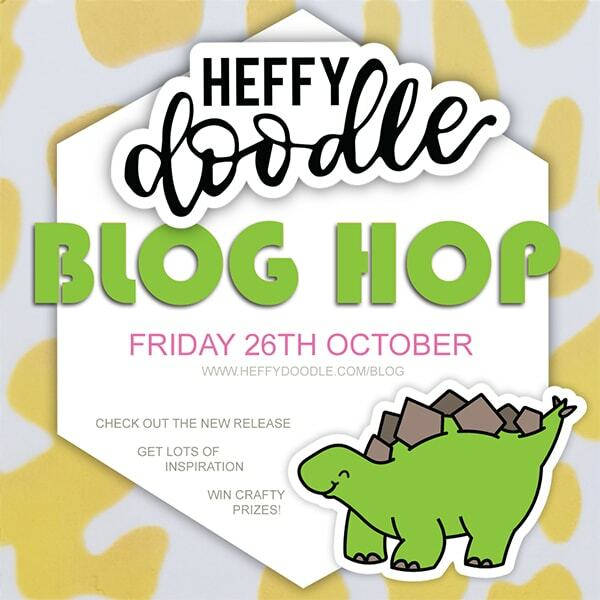 Winners will be announced on the Heffy Doodle blog on November 1st! You should have arrived from Mona’s blog and Gemma is your next stop! And don’t forgot to stop by the Heffy Doodle blog for details on Lesley’s sale and free with purchase items! I love how this seems like a very CAS card, but then you tilt it and get all the sparkle of your snowdrifts and flakes. It’s kind of a different take on a surprise card, which is cool. And I appreciate your honest assessment of the brushes. It’s hard to live up to the billing of calling them life-changing, especially since I haven’t really gotten into brushes either, but now I might just have to add them to the never-ending to-buy list. Thanks for sharing! Such a sweet mammoth…love these prehistoric creatures. Absolutely adorable, Jess! LOVE the Woolly Mammal! U did a wonderful job coloring that wooly mammoth!!! He looks so real! Love your background too! Love how the mammout looks so real….great coloring! The background bis beautiful too! Your little woolly mammoth is way too cute! Love how you colored the fur, and the snowy “nothingness” is also gorgeous! Love your mammoth. He looks like he has Eore’s type of attitude, “walking in the snow”……. 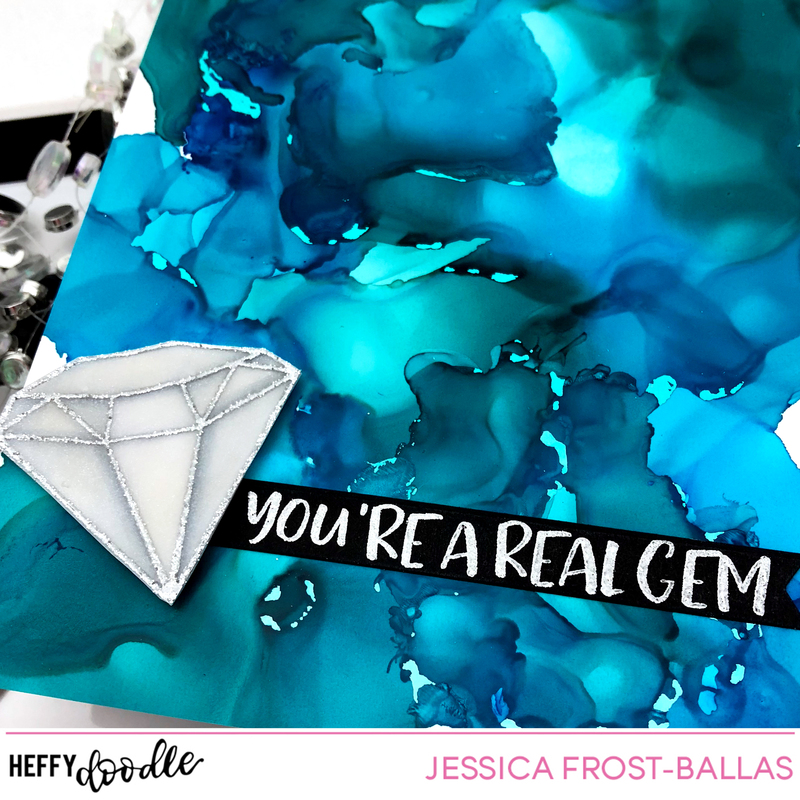 Love this CAS style of your card. The cute mammoth stands out beautifully from the pale background . I love your big and beautiful big wooly mammoth card! The colors are awesome and it’s a really fun idea for a winter card! 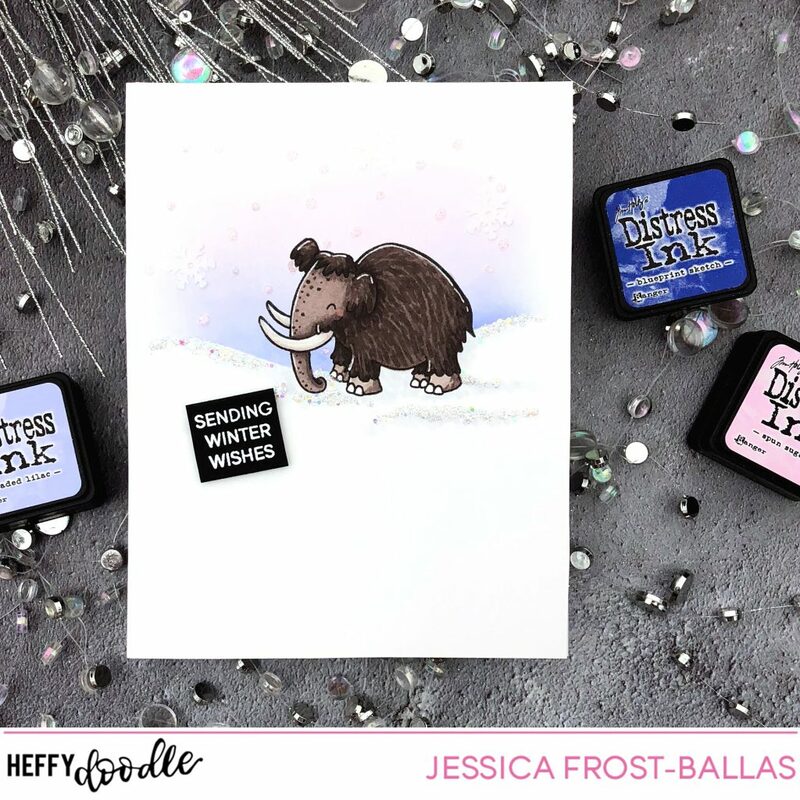 Love the background for this cute wooly mammoth and your coloring. The little added details make this card so unique! I love it! I really think this is cute! This card is so CAS but my gosh I love it. The blended background is just divine. I really need those brushes! I absolutely love this adorable Mammoth! You did a fabulous job, thanks for the inspiration Jessica! I came to your blog for some inspiration and I was not disappointed! I just love this card! So So cute! and how you did the snow and the woolly mammoth. And now there is yet another company I have to check out from following your blog! You don’t see that every day! 😉 What a fun holiday card!!! Love the Wooly!!! Always a pleasure to see your cards! !